Ukraine’s Interpol-wanted leader of extremist group Right Sector, Dmitry Yarosh, has been appointed as an adviser to the country’s Chief of General Staff. He has agreed to legalize thousands of fighters as an assault team subordinate to the regular army. “Colonel General Viktor Muzhenko, Chief of General Staff, and Dmytro Yarosh agreed the format of cooperation between ‘Pravy Sector’ [Right Sector] and the Ukrainian Armed Forces,”Ukraine’s defense ministry said in astatement. The appointment apparently comes after successful negotiations took place between the so-called Ukrainian Volunteer Corps (DUK Right Sector) and Ukraine’s top military command regarding possible options of incorporating the armed gangs inside the defense ministry’s structure of command. The Right Sector’s armed paramilitary battalions agreed to be “subordinated to military leaders,” the ministry said. 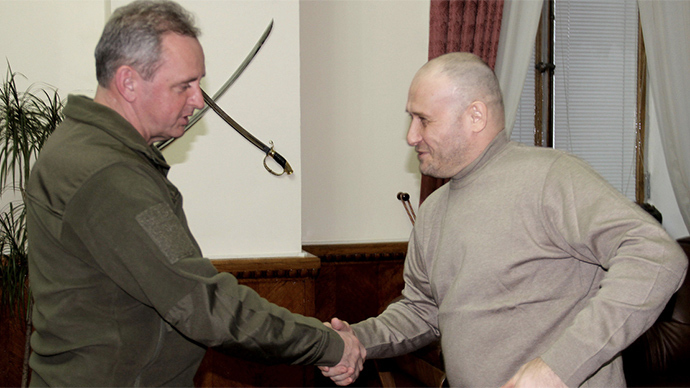 According to the statement, Muzhenko and Yarosh stressed the need for “unity”, confirming fighters’ readiness to obey Kiev’s central command. “DUK is ready to perform common tasks with the Army, ready to obey the army leadership in matters relating to national defense against an external enemy, which enables every patriot to protect Ukraine,” Yarosh said. Over the weekend Yarosh announced that he plans to legalize private military companies in Ukraine, and will soon introduce new legislation into the Parliament. The legalization comes after Yarosh offered to reform his Volunteer Corps into a professional assault team, in response to Kiev’s demands for all paramilitary units to surrender their arms or join the country’s official armed forces. Right Sector initially refused to obey the ultimatum, calling them “traitorous” and claiming that “volunteers and patriots” will only lay down arms after Ukraine’s territorial sovereignty is restored. The so-called volunteer, as well as territorial defense and other types of privately formed and sponsored battalions, have been fighting alongside Ukraine’s regular army since Kiev began its “anti-terrorist operation” in the east of the country last April. Many of them have been noted for their cruelty and murderous tactics against the local population, such as Aidar and Azov being accused by international human rights associations of war crimes. After a ceasefire agreement was reached in February, some of these armed units refused to leave the Donbass region and have regularly violated the reached agreements.